The following lecture addresses the topic of Rheumatoid Arthritis. In section one, the educator gives a detailed Overview of Rheumatoid Arthritis. In the start, General Aspects of Rheumatoid Arthritis are discussed followed by elucidation of its Epidemiology, Causes, Genetic Susceptibility, and HLA Subtypes. Subsequently, the educator sheds light on The Inflammatory Reaction that takes place in case of Rheumatoid Arthritis and highlights the Rheumatoid Factor. Furthermore, a deeper insight into the topic Rheumatoid Factor and Anti CCP is provided followed by an explanation of Joint Destruction and Synovitis. The educator also explains the Role of Cytokines in this disease. Section two is devoted to the elucidation of Pathology of Rheumatoid Arthritis. In this section, the Pathology is highlighted in the beginning after which different Stages of Pathology of Rheumatoid Arthritis are explained. These stages include Stage 1, Stage 2: Synovitis, STAGE 3: Joint Destruction, and Stage 4: Deformity of Joint. 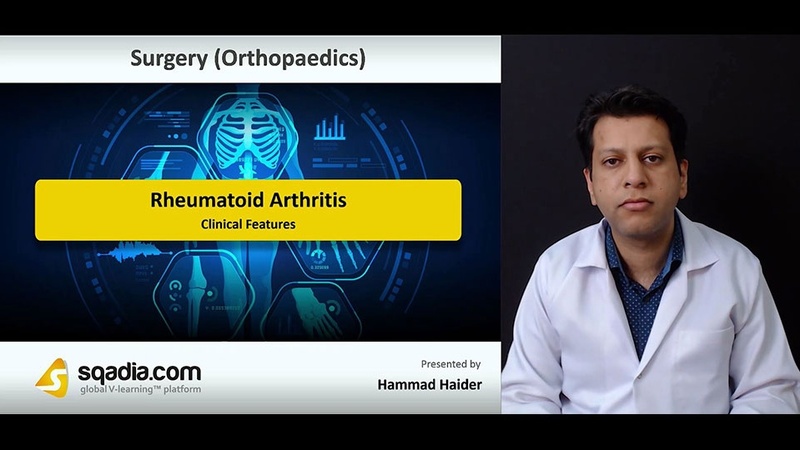 In addition to this, the educator brings under consideration RA Pathogenesis and focuses on various Extra Articular Manifestations of Rheumatoid Arthritis. Section three deals with the Clinical Features of Rheumatoid Arthritis. The educator starts off by highlighting the Symptoms of Rheumatoid Arthritis and then moves on to explain its History. Afterwards, a demonstration of this disease’s Presentation of Hand is provided followed by an overview of its Symptoms and History. After this, Typical Rheumatoid Hand Deformity is reported followed by elucidation of Examination of Patient in Rheumatoid Arthritis and RA in Lower Limb. Furthermore, the Extra Articular Features are highlighted in addition to the various Investigations which are carried out in this case such as Radiology, Blood Investigations and X-Rays of RA. The prime focus of section four is the Treatment of Rheumatoid Arthritis. The educator starts off by extensively explaining the process of Making Diagnosis and the Differentials that need to be kept in mind. An extensive overview of the Treatment approach in this case is conveyed and followed by an elucidation of Factors Ascertaining Prognosis. Following this, the educator brings under consideration the various options of Medical Treatment, Biological Therapies, Physiotherapy and Occupational Therapy that are opted for in case of Rheumatoid Arthritis. At the end of this section, the educator sheds light on the Surgical Therapy option available and highlights its Complications. In section five, the educator focuses on Clinical Practice Guidelines of Rheumatoid Arthritis. The Scope of Guidelines is addressed in the beginning followed by description of the concept of Remission. Afterwards, light is shed on Early Rheumatoid Arthritis and Established RA. Apart from this, the educator clarifies the concept of Laboratory Monitoring in case of Rheumatoid Arthritis and discusses special cases such as RA in CHF Patients, RA in Hep B/C Patients, and RA in Malignancy and Infection.